LiquorWise: Powdered Alcohol at a Liquor Store near you? Liquor - Just add water and stir. 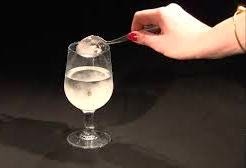 This is how simple it would be to mix yourself a cocktail if powdered alcohol was allowed for sale at your local liquor store. You could used it in any location out of reach of a liquor retailer or when it would otherwise be impractical – such as on a hiking trail. Mark Phillips is the inventor of powdered alcohol and calls it “palcohol”. Palcohol could be sold in one-shot pouches in varieties like rum or vodka and ready-made cocktails. His company is pushing for federal approval in the USA, although he has met resistance from those who first want authorities to determine how safe it actually is. They fear it may be snorted by users, but Mark says these fears are completely unfounded. "Palcohol is not some super-concentrated version of alcohol," Phillips said, adding "It's simply one shot of alcohol in powdered form. Why would anyone want to spend an hour of pain and misery by snorting . . . to get one drink in their system when they could just drink a shot and accomplish the same thing?" The outcome of the approval process will be of interest to South Africans, as most of what happens in the US usually finds its way to the SA market some time later. We can already see the supporters of sport events perking up at the possibility of enjoying their favourite drink after passing security and having bought a bottle of pure spring water (! ).